The first step in Outlook is to create file folders. I first create a folder identified as “Classes.” Then within this folder, I create a folder for each of the classes that I am teaching in a semester. I identify it by the 3-digit course number and the 5-digit class number. Additionally, if it is an on-line class, I place a O after the 3-digit class number. Below is what my mailbox looks like in Outlook with these folders created. After you have created your folders, then you need to direct Outlook to sort an incoming email from someone in that class into that folder. 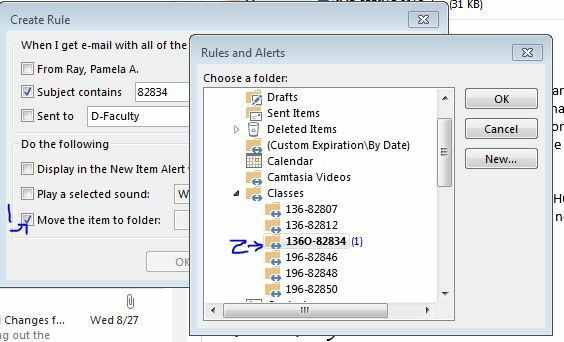 To do this, you create what is called a “Rule”; the rule create button is located at the top of the Outlook menu ribbon toward the right side as is shown in the visual below. Part of creating a rule is to specify what Outlook will look for before sorting the email. Therefore, I have Outlook look in the Subject line for the 5-digit class number. A note on this below. After you tell Outlook what to look for, you need to tell Outlook where to place the email. I show in the visual below choosing the specific folder I created earlier. Once you have created the rule, Outlook asks if you want to perform the rule on existing emails. If you have emails from classes already in your in-box, you will more than likely accept this option. If you have created this rule before the beginning of the semester, you more than likely will not have anything in your inbox, but I always run the rule, just out of habit. 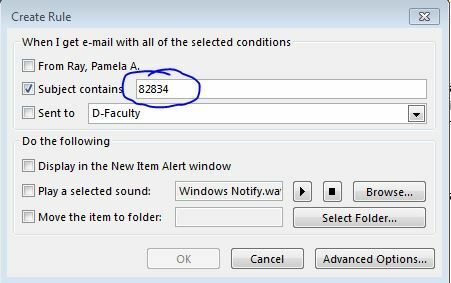 At the end of the semester, you will want to delete the rule since Outlook will continue to follow the rule as long as it exists. After the end of the semester, I move all my class folders to a folder called “old classes” for future reference, and when I forget to remove the rule, emails,which I never see, from former students are still sorted into the old class folders. 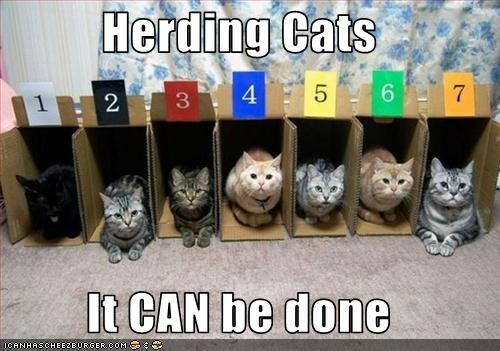 To make all of this work properly, you need to have the students’ cooperation. Therefore, I direct my students (and include this information as a requirement in the syllabus) that they either need to use the BlackBoard email system to send email (BlackBoard automatically includes the 5-digit class number as part of the subject line) or include the 5-digit class number in the subject line. A few students forget, but I can easily find out which classes those students belong to and move them to the proper folder. I also remind those students to include the class number in the subject line for future emails. This system makes my life easier and helps me monitor large numbers of students efficiently. Whether you teach face-to-face or on-line, this system will work for you. 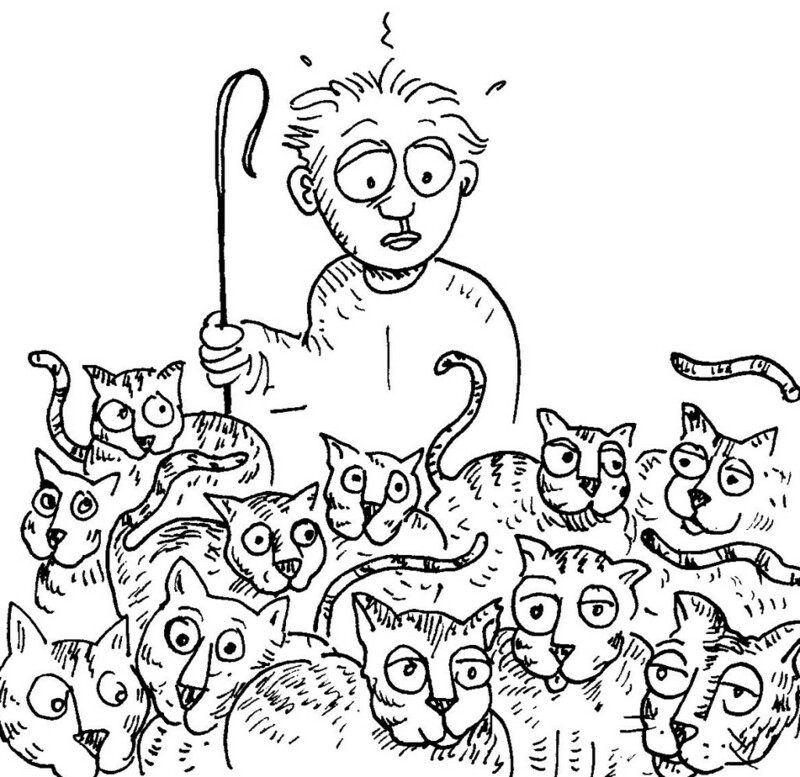 This is nearly identical to what I do. The biggest difference is that I use the course name, or a shortened version, rather than the 3 digits from the course number. I find the hardest time I have is getting students who don’t email me through Blackboard to use the class number in the subject. I tell my students that if they don’t have their class number in their subject, I may not see their email and be able to reply in a timely manner. I even suggest that I may never see the email since I get so many non-student emails daily.